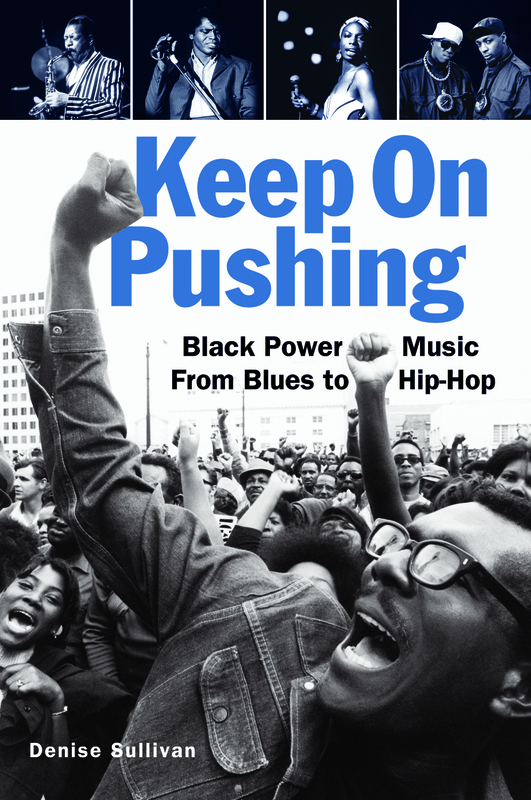 Music’s motivating role in protest movements is the focus of Denise Sullivan’s absorbing book “Keep On Pushing: Black Power Music From Blues to Hip-Hop,” from which she’ll read at Vroman’s Saturday. Five years in the making, it traces how freedom songs contributed to folk, punk and rap. In following connections from blues legends (Leadbelly, Lightnin’ Hopkins) through Woodstock-era icons (Jimi Hendrix, Buffy Saint-Marie, Gil Scott-Heron) and ’70s/’80s pop stars (Marvin Gaye, Public Enemy, Bruce Springsteen) to contemporary activist/artists (Michael Franti, Tom Morello), Sullivan quotes Dave Alvin, Solomon Burke, Chuck D, Odetta, Phranc, Bobby Seale, John Trudell and Little Jerry “Swamp Dogg” Williams amidst a broad spectrum of artists. Wayne Kramer recalls how MC5 received “intense criticism” from some who believed they should play for free. His comments feel particularly timely in light of recent controversy surrounding David Lowery’s response (http://thetrichordist.wordpress.com/2012/06/18/letter-to-emily-white-at-npr-all-songs-considered/) to an NPR intern’s essay (www.npr.org/blogs/allsongs/2012/06/16/154863819/i-never-owned-any-music-to-begin-with) asserting her peers will likely never buy music they “love.” Kramer also says MC5 wanted to make records because “it was a way to reach a lot of people.” Can music still reach and motivate large segments of the population? Sullivan believes it potentially can, while acknowledging music doesn’t have the “currency” it had in the ’60s. She compares 1985’s star-laden, anti-apartheid single “Sun City” to recent disaster fundraisers. “Everybody knew that song, everybody knew that video,” she says, citing “Sun City’s” MTV rotation. “We don’t have that kind of common experience. The concerts for New York City or Katrina — those were things we could experience collectively. Does it take a disaster, though, to get us all to plug into the same channel? On Saturday, accompanied by Buddy Zapata and other musicians TBA, she hopes to create what music provides: an intimate sense of community. “The way our lives are set up today, it seems we are less often able to gather in those kind of community spaces and have those kind of experiences. That’s how movements grew, and that’s how topical songs develop.